On 6th of February following a day of protests in Prague both for and against migration in Europe, the autonomous social center Klinika came under attack last night. During the day’s demonstrations, a legal, permitted march against “fortress Europe,” organized in cooperation with Klinika's collective, came under attack by more than twenty fascists and neo-Nazis. They came from behind the march, attempting to cut it in half as it turned a corner. As the peaceful protestors in the march turned to protect themselves from the fascists, an overwhelmed group of police offers intervened and stood between the two groups. The neo-Nazis began throwing whatever they could find at the marchers, including rocks, sticks, and small explosive devices. The marchers defended themselves by returning the projectiles; eventually the much larger numbers of the marchers intimidated the attackers into retreat and they turned and ran away. This group of fascists had been antagonizing people throughout Prague earlier in the day. I personally saw the same group earlier on public transport as I went to the rally. They were very aggressive with riders, including accosting one young woman as they tried to get her to come with them. She quickly left the train, visibly shaken, at which point one of them – previously speaking Czech – claimed she was a good “Deutsches mensch.” I got off at the same stop as them and we went different ways, I walked toward the beginning of the march, they went in a direction that would put them exactly in the position where they attacked the march. Upon completion of the march – which included continuous antagonism from nationalist elements and a few more radical characters – people made their way back to Klinika at differing speeds? When I arrived, there was a small group of people that had just learned that the Nazis were coming to attack Klinika. We prepared as best we could, but quickly came under attack. As they attacked, we pepper sprayed them--which kept them outside long enough for us to lock and barricade the door. At this point they started throwing rocks at the windows, shattering the old medical clinic’s windows with ease. As we attempted to barricade the windows, glass and debris flew everywhere. One member of the Klinika collective was hit, creating a gash on his forehead. The rocks were followed by the Nazis throwing in a lit flare that sent sparks and flames all over, but the flare got caught in the shards of the multi-paned glass still jaggedly protruding from the window. We quickly put this out as the rocks stopped flying. At this point, things calmed down for a few seconds as people throughout the building checked on each other. However, the calm quickly ended as one collective member yelled “Fire!” Several of us ran into the hallway the smoke was coming from and found thick smoke throughout the entire atrium--the entire downstairs cafe area was full of smoke, with flames leaping from the window at the entrance. The Nazis had apparently broken the windows downstairs in the same fashion as upstairs and thrown another incendiary devise in, which lit the drapes on fire. We were still able to put it out without much permanent damage to anything but the windows and furniture. 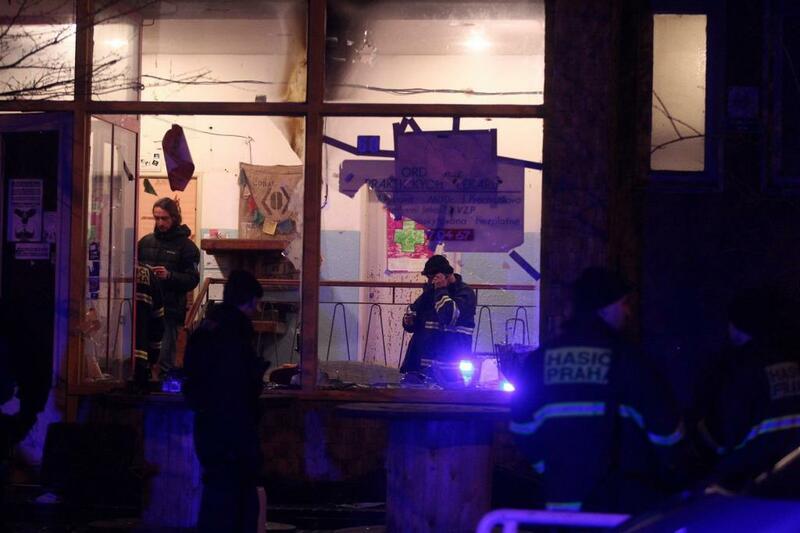 This was a brazen and coordinated attack on an autonomous social and community center in the heart of Prague that offers a free non-commoditized space for people of all ages and persuasions to take free language lessons, have a quiet beer, take their kids to nursery school, attend free lectures, and even attend meditation classes. However, the center has also been a hub for aid and relief for migrants, and therefore a target within the migrant crisis gripping all of Europe. The center acted as a staging area for relief goods going east and south for newly arriving refugees from the war-torn areas of the Middle East and Central Asia. Given the day’s protest event against migration in Europe and the escalating anti-Muslim rhetoric and political climate it foments, Klinika’s aid to migrants could easily be said to be the rationale for the attack – if there ever could be a rationale for such an irrational act of violence, or, better put, terrorism. For this was, by definition, an act of terrorism. This group of fascists attacked an innocent group of people providing a safe space for the community and aid for those in need. Whether you agree with Klinika's politics or not, with migration or not, there is no justification – nor can there be – for the same type of terrorist attack that these fascists and their nationalist brethren portend to be against. If you hate Muslim people because .000001% are engaged in radical politics and use violence in an attempt to get their way, then how is anyone to condone the same thing within our own midst? Again, whether you agree with Klinika's politics or not, if this is a democracy in which everyone is entitled to their political beliefs, then you have to respect Klinika's political efforts and condemn this brazen act of violence against peaceful protestors and an autonomous community center simply trying to help people. Klinika exists in peace, and now – as 400 plus people have come to show solidarity today – Klinika survives and excels in defiance of violence and terrorism. Whether you agree with Klinika's politics or not, with migration or not, there is no justification – nor can there be – for the same type of terrorist attack that these fascists and their nationalist brethren portend to be against.